Are you looking for a PS4 charging station, cooling system or better yet an all-in-one PS4 stand? There’s a massive amount of PlayStation 4 gaming accessories out there and one of the best to own in our opinion is a DualShock 4 controller charger. But if you’re having overheating problems with the PS4 then owning a cooling fan would definitely benefit your console. Want the best of both worlds? Then purchasing an all in one vertical stand for PS4 will give you the luxury of both a cooling system and a DualShock 4 controller charging station! With so many choices out there it can take a bit of research to find exactly what you need. Fortunately for you we have done all the leg work and here you’ll find the best PS4 stands and charging stations on the market. Our list of products we’ve detailed has options for the standard PS4 model, the PS4 Slim and the PS4 Pro. Therefore, regardless of what model you have we have got you covered. Want to quickly compare the top All-in-one vertical stands for PS4? While taking a look at our list of the best PS4 all-in-one vertical stands consider why they might be worth your money. The one that you choose will depend on the type of PS4 console that you own and what your specific needs might be. If you own a standard PS4 then you’ll want to go with the first two items on our list. For PS4 Slim owners go with the Younik PS4 Slim Vertical Stand Cooling Fan and the PS4 Pro users should buy the UZOPI PS4 Pro Vertical Stand. You may have noticed that all of the vertical stands have some of the same core features among them. Among two of the best features are the PS4 cooling fans and the DualShock 4 charging stations. Before you buy an all-in-one vertical stand you need to be aware of what those features are and if they can add value to your gaming experience. The most important feature is the ability to charge both of your PS4 controllers at the same time. No longer will you need to worry about running out of battery life during a gaming session. 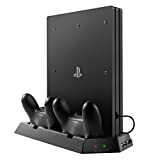 The fact that you no longer need a separate charger, vertical stand, and cooling component means that you’ll save money as an all-in-one PS4 stand contains all the features you need in one product. The cooling fans included in the stand are a great benefit to gamers whose PS4 consoles tend to run hot. The fans produce an airflow that helps to keep the inside components cool which is a huge deal if you have overheating issues. Furthermore, these vertical stands as the name suggests do a great job of allowing the PS4 to be stood up in the vertical position. This is a space saving feature that those of you with limited room can appreciate. In conclusion, these PS4 stands have been chosen for their great build, quality features and competitive price points. You will not go wrong by buying one of these for your PS4 console setup, and once you do you’ll feel like you were missing out. When buying a PS4 stand there are a few factors you should watch out for so that your buying decision is improved. The first thing you should look at is if it is compatible with your console, and then consider the number of controllers it can charge at once. If you have two PS4 controllers then it makes sense to invest in a charging unit that is able to charge both controllers at once. Also consider the amount of time the recharging needs to take place. A PS4 all-in-one vertical stand comes with a bunch of additional features that add value which includes cooling for your consoles, storage room for games/peripherals, space saving vertical design and USB ports. You’ll see from our list that we have made sure all of these features are present in the products we are going to recommend to you. Who said a best selling all-in-one PS4 vertical stand needed to be expensive? Because this one definitely is not! This PS4 all-in-one vertical stand is ideal for those of you that have the standard version of the console. 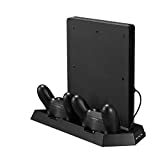 The Kootek Vertical Stand for PS4 is great if you are fed up with constantly having to change the batteries on your PS4 controllers, or simply run out of power mid-way through a game. This can be avoided by investing in a DualShock 4 charging station such as this one. If you make it a point to store the controllers in the charger whenever you aren’t playing, then you’ll always be topped up on energy. You won’t have to worry about charging your PS4 controllers ever again, sounds great right? Also as a side bonus if you always store the PS4 controller in the charging unit then there is a considerably lower chance that you are going to lose one of the controllers. This could be a beneficial aspect if you have a messy room and tend to be disorganized. This charging stand comes with 2 cooling fans that decrease the heat that’s generated by your console. Keeping the temperature of your console low means that performance will not deteriorate over long playing sessions. Also it keeps the components of the PS4 healthy, which leads to a longer console lifespan. All electrical equipment has the drawback of generating heat. The cooling feature of this charging unit is a feature that is a huge plus. Worried that your console will tip over in the vertical position? This PS4 charging unit is designed to house the PS4 console in the vertical position in a way that keeps it very stable – the chances of it tipping over are drastically reduced. The PS4 console takes up considerably less space when it is in the vertical position, so this feature is perfect for those of you who are looking to improve how well organised your room is. Do you own two PS4 controllers that you need charged at the same time? Then this charging unit has got you covered. You can charge both controllers simultaneously, but if you have more than 2 controllers than need chairing then you’ll need to rotate them, or invest in additional chargers. There is also a convenient set of USB ports where you can charge/connect devices such as your smartphone, keyboard or mouse. Having additional USB ports is always helpful, especially if you have a number of devices that make use of USB ports at the same time. The build of the charging unit is black and is made of strong plastics. A great looking clean design that goes with the overall look of the PS4 it will blend in nicely with your current setup. You should find that the charging unit will last for many years without a problem. In conclusion, the Kootek Vertical Stand is a great PS4 vertical stand that is a must-buy for any owner of the standard version of the console. The range of features such as USB ports for connectivity/charging, 2 cooling fans, vertical console housing and charging for 2 controllers makes this a great buy. At the price this charges you really are getting a lot of value. You’ll be hard pressed to find a better all-in-one charging stand that ticks all the boxes. Just keep in mind that you cannot use this PS4 charging unit for the slim and pro versions of the console. For charging stations compatible with those specific console versions look at the other entries in our review. Another great Kootek product that is perfect for those of you that own the standard version of the PS4 console. It is a must-buy if you own the standard version of the PS4 console because of the many benefits that it brings at the affordable cost. This is one of those console peripherals that isn’t overpriced, and most could argue it is under-priced. The low price makes this a perfect gift that you could buy if you have a family member or friend that owns a PS4. The blend of features is something you need to consider when deciding if this peripheral is for you. The first feature we will mention is the fact that this unit can charge two PS4 controllers at the same time. That’s great if you do not want to worry about charging your controllers ever again. Simply keep them stored in the charging unit when not playing, and by the time you play the next day the controllers will be charged again. This avoids the frustrating scenario where you have a buddy round your house and the controllers run out of power in the middle of a good game. The charging unit is reliable, so expect consistent charging performance for many years to come. Do you find that keeping your games organized is constantly trouble? Then you’ll find the games storage feature of this stand very useful. You have the space to store up to 14 games and 8 controller thumb grips. If you own more than 14 PS4 games you can simply keep the games that you play most frequently in the stand and the rest out of sight. This feature is going to contribute to a much more organized look in your room, which will be most beneficial to those of you that have a lot of clutter in your room. Do you need extra USB slots to connect devices such as a mouse, keyboard, headphones and tablet? Then you’ll be pleased with the 3 USB ports on this stand. The USB ports are prefect for those that need a more accessible point of access or you simply tend to run out of ports on a regular basis. This feature is another plus for the product that you should consider when making a buying decision. Are you worried about how hot your PS4 console gets during long gaming sessions? It’s a major concern for gamers that play for many hours at a time, and this purchase will address that. The Kootek Vertical Stand comes with two in built fans that allows your console to be kept cool. All electrical equipment when used increase in temperature and cooling should always be a concern. The cooling that comes with the PS4 is good, but any extra cooling that you can provide is always a bonus. At this low price point it is a feature that can make all the difference during a long session. In conclusion, the Kootek Vertical Stand for PS4 boasts a lot of great features for any PS4 owner at a price point that’s very competitive. The variety of features such as the storage of games, USB ports, ability to charge two PS4 controllers and 2 cooling fans means you really are getting a lot of value for the money that’s spent. The only disadvantage is that this unit isn’t compatible with the PS4 pro or slim versions. Are you a PS4 slim owner that is interested in upgrading their setup? Then the Younik PS4 Slim Vertical Stand is a must-have item alongside your PS4 slim. It solves a number of problems at a price point that is very competitive. For example, have you ever had the problem of not having enough battery power for your PS4 controller to last you an entire session of gaming? That can understandably be very frustrating and this stand aims to eliminate that. The charging time is relatively low, and allows you to charge two controllers at the same time. You simply need to keep both controllers in the charging port when not in use and you never have to worry about running out of battery life again. Are you the type of gamer that enjoys playing for long sessions? Then you need to make sure that your PS4 console is kept cool at all times. The internal cooling system of the PS4 slim is quite good, but more cooling would be even better. Fortunately, the Younik PS4 Slim Vertical Stand comes with cooling fans to reduce the temperature of your PS4 slim. This will be a great asset to have when you need to keep you PS4 Slim cool during those heavy usage days. The cooling fans are constructed in a way that will be barely audible, so during play you will not hear them at all. For the excellent price of this PS4 Slim charging station you’re getting a great feature in the PS4 Slim cooling system. Furthermore, the PS4 Slim charging station allows the PS4 Slim to be stood up vertically with little chance of falling over. This is an excellent feature, because it means that space can be saved. Typically a PS4 that’s stood up vertically is prone to falling over if a little force is applied. So the ergonomic features of this stand will be very much appreciated by those looking to save space. Wondering how long it will take to set the PS4 Slim charging station up? It’s a simple plug and play device, which means you insert the PS4 into the unit and plug the USB cable into the PS4. There are no extra steps that you need to do in order to activate the unit. To disconnect you just need to take the USB cable back out again. This minimalist design will impress you if you hate having to go through a lengthy install process when you get new tech. The last feature of the PS4 Slim controller charger that we’ll mention is the 3 extra USB ports that can be used to charge devices or simply connect them to the PS4. Also data transfer is possible via these USB ports to the PS4. Having extra USB ports allows for a more flexible gaming experience, because devices such as a keyboard, mouse and tablet can be connected. To summarize, the Younik PS4 Slim Vertical Stand is a good investment for anyone out there that has a PS4 Slim in their home. The price point makes this affordable for all PS4 Slim owners and the range of features will improve your gaming experience. The 4-in1 setup provides fast charging for two controllers, there is a cooling fan to reduce the temperature of your console, there are 3 USB ports and then you can position the console vertically without fear of it falling over. Just keep in mind you will not be able to take advantage of the PS4 Slim controller charger if you do not own a PS4 Slim. ULTIMATE COOLER - 3000PRM Whisper Quiet Fans, keep your PS4 Pro cool and calm with this vertical cooling stand. No worrying about your console overheating and burning your table from long hours of game play. LESS TIME-CONSUMING CHARGING - Charging station with 2 high power charger ports to charge your PS4 Pro controllers faster, saving your time when need to charge the controllers. SPACE SAVING DESIGN - Normally your PS4 Pro sits horizontal taking up space within your room. However, with this vertical stand, your ps4 now stands vertically, saving you lots of room space while cooling your ps4 at the same time. SIMPLE SETUP - Just place your PS4 Pro in the stand and connect the built in cable. This little USB cable powers everything. The hub and the fans will have power along with the charge slots. COMPATIBLE PERIPHERALS - 3 extra USB ports allows you to not only save your game in data storage, but also charge your handset or electronics while enjoying your game. The UZOPI PS4 Pro Vertical Stand is the product to buy if you are an owner of a PS4 Pro. It comes with 4 major features at such a low price point that you really are getting a bargain for the amount of money it costs. You could buy it for a friend or a family member as a Christmas present, and they’ll certainly be pleased with it. The practical features add a lot of flexibility to how you can enjoy the PS4 gaming experience. Compared to the other vertical stands for the PS4 Pro this ticks all the boxes and you aren’t getting charged a premium price. The first thing that you’ll need to do is setup the PS4 Pro controller charger which will only take a few moments. You’ll need to insert the PS4 console vertically into the PS4 Pro charging station, and then insert the USB cable into the console. Once that is done the setup is basically complete – there is no need for a software install or anything like that. Note that because you’ll be housing the console vertically in the stand you will be able to save some space. For example, if you like to keep the console on top of your desk, then this stand will be ideal. Also because of how well the stand is designed there is little chance of the console tipping over. You can be confident about the safety of your console sitting vertically in this PS4 Pro controller charger. Cooling fans are another great feature present in this PS4 Pro charging station that helps keep your PS4 Pro cool. The internal fans of the PS4 Pro are excellent, but having additional cooling is even better. This extra cooling is perfect for those of you that are going to be gaming for long sessions. During long sessions your PS4 Pro can get quite hot. The fans on this PS4 Pro cooling system have a 3000RPM and don’t make much noise so you don’t have to worry about the PS4 sounding like a vacuum cleaner once you turn it on. One of the main reasons why you will buy this PS4 Pro charging station is for the functionality of being able to have your PS4 controllers recharged. It can be very frustrating having to deal with a loss of battery life to a controller once you are in the middle of a gaming session. Fortunately, all you have to do is keep the controllers in the vertical stand while not in use and they will be kept charged on a daily basis. The great thing about this charging unit is the speed of charging is fast. You will not have to wait for long before you will be ready to get back into the game again. You also get 3 USB ports where peripherals can be connected such as a keyboard, mouse, smartphone or tablet. Using these USB ports you can charge devices up or you can connect them for data transfer. 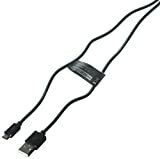 This added functionality is much needed as nowadays USB connectivity is very popular. To summarize, the UZOPI PS4 Pro Vertical Stand is the ideal purchase for anyone who owns a PS4 Pro. The features for the price provides so much value that it’s surprising the cost isn’t higher. For the low price you get the ability to charge two controllers, cool your console via cooling fans, get 3 USB ports and be able to keep your PS4 vertically stood up. If you are the kind of gamer that enjoys having some flexibility to their setup and is constantly on the lookout for new tech to help you do that, then the UZOPI PS4 Pro Vertical Stand is a no-brainer purchase. Just keep in mind that this stand is only compatible with the PS4 Pro, not the standard PS4 or the PS4 Slim. Want your PS4 to stand vertical like the retro Xbox 360? The Ortz PS4 vertical Stand is by far one of the best PS4 vertical stands on the market today, since it has so much to offer. In addition to it being a controller charger it also has a built in cooling system, which prevents your PlayStation 4 from overheating. This product has two charging ports on the side that allows you to charge your DualShock 4 controllers. On the plus side this PS4 controller charger can take up less space having it vertical, leaving you with some extra space. This is probably the most unique charger that you can buy, since most charging stations do not come with its own cooling section. Plus, the price is not much higher than the average PS4 controller charger. How loud is the fan and could it ruin my gaming experience? Well, the fan is very quiet when in use, but if it does bug you then having a pair of headphones is not a bad thing. If you were to ask any gamer they would say that gaming with headphones gives you a whole different experience. However, if the fan gets too annoying for you there is an option to turn it off. 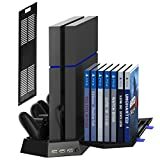 Universal PS4 Console Vertical Stand Fan Cooler with Dual Charging Station and 2 HUB 1 USB Ports. Not only work for PS4/PS4 PRO/PS4 Slim but can also charge the PS4/Playstation 4/DualShock 4 Controllers and also your mobile phone, power bank or other USB device at the same time. What an amazing Tool. 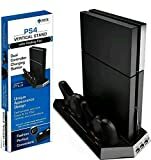 Universal PS4 Console Vertical Stand Fan Cooler keep your PS4/PS4 PRO/PS4 Slim cool and calm with the vertical cooling stand; Dual Charging station with 2 charger ports to charge both of your PS4 shock controllers simultaneously, saving your time when need to charge the controllers; 2 HUB and 1 USB ports with powerful output for data transferring and charging. BEST PS4 ACCESSORIES TO KEEP YOUR PS4/PS4 PRO/PS4 Slim COOL. No need to worry about your ps4 will overheating and burning your table from long hours of game play. SPACE SAVING DESIGN: Normally your PS4/PS4 PRO/PS4 sits horizontal taking up space within your room. However, with this vertical stand, your PS4/PS4 PRO/PS4 now stands vertically, saving you lots of room space while cooling your ps4 at the same time. 100% SATISFACTION GUARANTEED with 100% NO HASSLE MONEY BACK WARRANTY: Try it out at our expense and if you are not fully satisfied, we will refund your money without have to return the product. CLICK the ADD TO CART button above to secure your PS4/PS4 PRO/PS4 cooler fan now ! Here we have another charging station with its very own cooling system. The KingTop Fan PS4 cooler has two very powerful cooling fans to prevent your console from overheating after long durations of playing time. This dock allows you to charge more than one controller, which makes it a great purchase for those who play CO-OP a lot. Having the PS4 stand vertical allows you to have more space to put things down such as games and so forth. The price range for this charger is very good as you will most certainly find a discount on this product making it more cost-effective. It is by far one of the most multi-functional items on this list, it has 2 HUB and 1 USB port that has a powerful output for data transferring and charging. Don’t like the product? Well, if there is a chance that you don’t like what you paid for then you can always get your money back, because this charging dock has a 100% no hassle money back guarantee policy. Those are just a few of some of the best PS4 controller chargers on the market today. Deciding on which one to go for is no easy task, but through trial and error you will find what you are looking for. Look at what you most need when purchasing a charger. Do you need a cooler? Or maybe you need a headset charger too? These are some things that you might want to consider. For example, if you are a casual gamer who doesn’t want to spend much then going for the dreamGEAR- Playstation 4 Charge and Play Premium Connection Cable may be the perfect option for you. Retailing at a dirt cheap price point this product wouldn’t be too expensive comparing to the other items on this list. There are a lot of different benefits of each PlayStation charger, but it is up to you to pick out what is best for you. It can be difficult to pick and choose what the better option is as they look so similar to each other, however once you starting going into detail you will begin to see how much they all differ from each other. For the most part all you’re looking for is something to charge your controllers so picking anything from this list is a great deal. The main focus should be the price. You don’t want to be paying for something that is going to break after a while. Instead paying more and getting something that will last a while would be more worth it in the long run. Have in mind if you were to buy something from the original company it’s going to cost much more than going to a lesser known one, since people are more certain that the original company is going to provide them with a product that is of high quality. On the other hand, going for the less known path could be better as you would pay less for the product. Price: How much are you willing to spend? A higher quality the product inevitably cots more, but if quality is not an important factor to you then getting something simple that will charge your controller would be more worth it. The cheaper controller chargers range from 10-20 dollars, which is a bargain compared to some of the overpriced ones. Charging time: Charging time is any gamer’s worst nightmare. Imagine coming home only to find out that you forgot to charge your controller. In this case having a PS4 controller charger dock would be perfect. No more batteries: Ever get bored of changing your batteries? Charging your batteries will become a thing of the past, since now all you will have to do is plug your controller into the charging station. Plus, you won’t have to buy any more batteries, thus you will be saving money too. Solo or dual: Buying a solo charging station is great for those people looking to spend less money on their PS4 charging dock, since solo chargers are much cheaper than dual. However, going dual may be more worth it as you could play with one controller until it runs out, then switch them up. Also, if you normally play with friends then going dual would be more practical. 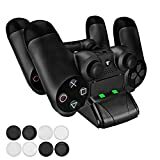 As you can see there are many factors that come to play when deciding to purchase the best PS4 controller charger for you. I’d recommend that you write on a piece of paper each pro and con until you find something that you like. Take a look at the list of some of the better PS4 controller chargers on the market today. Are you interested in buying the best PS4 controller charger, but have no idea where to look? Picking out the best PS4 controller charger for yourself can be a tricky task if you don’t know what to look out for. There are a lot of great PS4 accessories out there but a DualShock 4 charger should be at the top of your list of must own accessories. There are a lot of differences between each charger you choose for your beloved PS4 controllers. Therefore, when you pick out a controller charger you need to focus on what will benefit you the most. The worst thing that could happen to a gamer is coming home to find out that your controller is dead, to avoid that I am going to show you some of the best PS4 controller chargers. 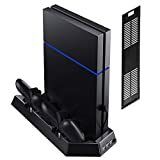 How can I avoid buying a PS4 charging station that won’t suit my needs? Well, first you need to think of what you need most in a PS4 controller charger. For example, maybe you want a charger with a wire, in this case you could play whiles charging the controller. Some of the PS4 chargers come with dual charging stations, which lets you charge two controllers at once. Having the option to charge two controllers simultaneously is great for those people who regularly play with their friends or family, since you would be able to charge your controllers twice the speed of solo chargers. SAFE - With built-in excellent smart protector chip, you'll never get over charged /over heated /over current / over voltage / short circuit / over discharger your PS4 controllers. First off we have the Megadream Dual USB charging station. It’s great for those gamers who need to charge two controllers at once. It has built in micro USB micro adaptor ports, which allows you to securely store and charge more than one controller. You could even charge your controller through your PS4, PC or wall using the USB adaptor, which can make things easier if you prefer charging your controller using different methods. Are charging times long? No, the charging times on this PS4 charging station is extremely short compared to other chargers. When charging one controller you will have to wait up to 2 and a half hours, however if you choose to charge both controllers then it will take a little bit longer – up to 3 hours. It will also show you what the status is on your controllers with LED light indicators. Shining red for charging and green for fully charged. With the design of the Megadream Dual USB Charging Dock Station it is very simple and easy to use with its sleek and compact design. This charger works perfectly with the PS4 slim, pro and original controllers. This product comes with one charging base, one charging bracket, instructions on how to use and one USB charging cable. The input voltage for the charging station is 5V 1000MA and the output that goes into the controllers are 500MA each. However, when charging one controller it will charge faster as the controller will get more power. In addition it has a built in protector chip so it won’t over charge your controller, thus you could leave the controllers to charge overnight. 【Powered by USB Adapter Ports】- Comes with a USB charging cable, simply plug into your PS4 console, PC host and any other standard DC 5V adapter. provides an easy and quick way to charge and store your controllers. Ideal for saving your place to store your controllers in the charger when you're not playing. 【Anti-Skid Function】- 4 anti-skid glues guarantee the stable balance, prevent the charging dock from wrong shifting. Made of durable ABS Material that can assure unmatched longevity. You will get 4 white and 4 black useful bonus thumb grips for controller joysticks. It's really an ideal gift for video gamers. PECHAM WARRANTY: 12 MONTY WARRANTY & 100% SATISFACTION GUARANTEE. Ever have the problem where you are charging your controller, but have no indication if they are fully charged or just barely? Well, with the Pecham DualShock 4 Dual Charging Station you won’t run into this problem as they have LED lights that tell you the status of your controller. Along with getting one of the best PS4 controller chargers you will also get a USB charging cable, plus four white and black thumb grips for free. Like most high quality charging docks this one lets you power up two controllers at once. This saves a lot of time and money, because no longer will you have to charge batteries for hours, and you won’t have to spend a single dime on rechargeable batteries. Some other great things to point out is the design, being the classic all black this charger will look excellent next to your PlayStation 4. In addition the price is extremely low for the quality of the product. Need something portable? Well look no further! The Pecham DualShock 4 Dual Charging Station is very compact, which allows you to easily take it wherever you go. It is very light weighing just 53g making it one of the lightest chargers on this list. Also, it is very small at 150 x 55 x 35 mm in size, therefore taking it on trips would be really easy. In addition, it has anti-slip pads on the bottom so you can put it on smooth surfaces without thinking twice if it’s going to slip. 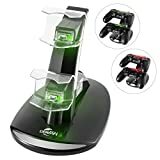 Another great PS4 charging station is the CBSKY Dual USB Charging Charger Docking Station Stand, since it has many benefits for any gamer who is looking to charge their controller. This charging dock is powered through a USB port either from the PS4 or PC. However, you can charge your controllers through a power socket if you use a USB adaptor, which you can buy separately. This PlayStation charging station allows you to charge up to two controllers simultaneously, which is good if you’re an active gamer, because if you run out of power on one controller you can quickly put it to charge and use the other. However, if you don’t mind playing with a wire attached to your controller then you can plug in the USB wire and play while charging your controller. The cable length is about 3.3ft so you would be pretty close to your screen, which is not ideal as this can lead to eye strain. Also, the charger will not charge over 70% of the battery when you are actively gaming. This is to prevent the battery from overheating and breaking. The Dual USB Charging Charger Docking Station Stand has LED lights to show you how much the batteries are charged. Blue means 100% and red means that it is still in the process of charging. The PS4 controller charger has a built in protector chip that will never let your controller overheat, in this case you can leave your controller to charge overnight. Charging times are very short being only 30 minutes, which is incredible. The input voltage is DC 5V 1000MA and the output to each controller is DC 500 MA. Next on this list is the Collective Minds PSVR Display Stand for PlayStation 4, which is an amazing product for gamers looking to charge their headsets as well as controllers. It has a place where you can store your PSVR at the top, on each side there is a USB port to charge each controller and on the top there is an addition USB port to recharge your gaming headset. In addition, there are LED’s on the sides, which will show you the charging status of all your gaming gear. With all these features this defiantly makes it one of best PS4 controller chargers. Do you sometimes forget to charge your controllers, headset and even more? With this PS4 charging station forgetting to recharge your stuff will be a thing of the past, because once you are done gaming it will become a habit to put everything on charge. Most products aren’t even ready for VR, but the Collective Minds PSVR Stand is, with its very own charger plus the two controller chargers. With so many features wouldn’t this cost a ton? Although this is one of the more expensive products on this list it is by far one of the best, because there are so many features that make up for its price. You’re not only buying a PS4 controller charger you’re buying a much more valuable product. Extra long, 10 foot PS4 charge and sync cable to allow continued play even while charging the DualShock 4 Controller - no more excuses! No power loss with this premium cable for full speed charge even with extra-long length. Extended strain relief to keep cable from cracking or fraying during active game play. Solid injected ABS connectors with machine stamped connectors create a solid continuous connection - no need to baby this cable, it is made to handle tough play. Fully certified for use with all PS4 DualShock 4 controllers. Are you the type of gamer that forgets to charge their batteries? Then the dreamGEAR- Playstation 4 charger maybe the best thing for your gaming needs. You will never have to charge your batteries again, however you would need to plug in a USB and connect it to your controller. Having a cable is very beneficial as you can play and charge your controller simultaneously. However, the cable can get annoying for long gaming sessions. The cable is extra-long being 10ft and certified to be used with all PS4 DualShock 4 controllers. The cable is made out of a premium material, which allows it to have absolutely no power lose. It also has an extended strain relief, that keeps the cable from cracking and then eventually breaking. Plus, it has ABS connectors with machine stamped connecters that create a strong continuous power flow, this makes it very though and durable. This PS4 controller charger could even give a nostalgic feeling for all the older players, since back in the day all you could play on was wired controllers. This charger can work on pretty much anything even on an Xbox One, pretty much anything that has a standard micro USB charger. Although it is USB 2 and not 3 it still does its job perfectly fine. You don’t need a USB 3 when doing simple tasks like charging a PS4 controller. You could even sync data with your phone and PS4 using this charger, which makes this an excellent choice for people wanting to sync their phone to their PS4. Another great PS4 charging station on this list is the Nyko Modular Charge Station, which is the only one on this list that you have to attach it to your PS4. The design and style is very beautiful it allows it to take as little space as possible in addition being compatible with other Nyko accessories. 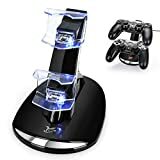 The PS4 charging station comes in black or white color so if you’re looking to match your charger with the PS4 then this may be the best PS4 controller charger for you. This charging dock can charge two controllers at the same time, moreover you won’t need a USB cable when using this PlayStation charger. Instead you will have to slide the Nyko charging station into the USB slot and put in micro USB dongles into the controller to begin the charging process. The patented dongles make it very simple and easy to charge the controllers, since all you have to do is put the controller on top and that’s it. However, this model is not compatible with the PS4 slim or the PS4 PRO. Having a non-wired charging dock has many benefits such as the wire cracking and breaking, wires getting tangled and wires not working because they deteriorate over time. However, have in mind that the charger only chargers when the PS4 is in sleep mode or turned on, which is the one of the only minus of this product.